LOOSE: Neon Edition | Hot Jambalaya! 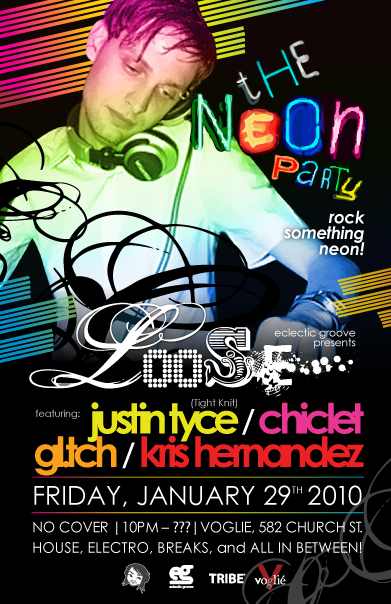 EG is back on a throwback tip for our first party of the year on Friday, January 29: LOOSE – NEON Edition! Beat the winter blahs by rockin’ some bodacious neon biz! And special guest: Justin Tyce of Tight Knit! oh ya, as always…it’s FREE! With just over 9 years of Djing and 10 years of promoting under his belt Justin Tyce has learned how to rock a floor. From warm up to banger the bases are always covered. Currently he resides as 1/4 of the infamous Tight Knit Djs, a crew known for their versatility. Always expect a set that goes from high to low taking you on a journey, and catering to what you wanted to hear (even if you didn’t know it). P.S. I’m gonna close the night with an oldschool/rave/classics set. Get out the fat pants!